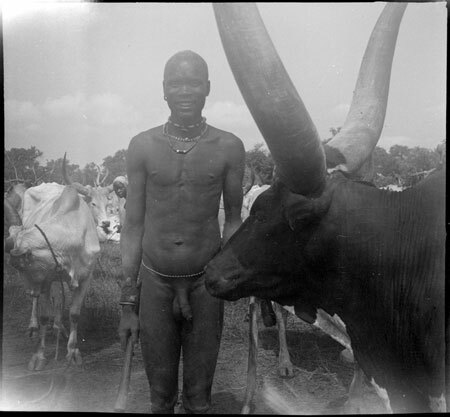 A three-quarter length portrait of a Mandari youth in a cattle camp standing beside his dark coloured display ox (sönö) with large upcurving horns. Most Mandari cattle are light coloured with little marking, and so this ox's dark and mottled markings would have been valued. The Mandari, in common with other cattle-keeping Nilotic peoples, prized contrasting markings on their cattle highly, and often trained the horns of their special ox to grow in different directions. Morton, Chris. "Mandari youth with display ox" Southern Sudan Project (in development). 03 Jan. 2006. Pitt Rivers Museum. <http://southernsudan.prm.ox.ac.uk/details/1998.97.378/>.